This is the first day of Navarathri. From this day on, in Tirumala, Brahmotsavam is performed for Nine days. In the morning, Kalasam will be setup. 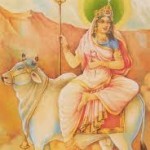 Amma/Devi's name on this day is "Shailaputri". Devi(Goddesss) is portrayed as wearing a golden yellow saree and with a smiling face. Today, the prasadam is "Katte Pongali"(for which you can find the recipe here). From Paadyami(1st day) to Shashti(6th day), sweet pongal can also be prepared.